Application Method: Appling in the field of food, health food, medicine. 1. Bread, steamed buns, cakes: (1) 3%-5% lecithin powder is added in the bread to evenly disperse moisture in the dough. The bread becomes more flexible and swollen, lecithin soften the bread and prolonged the durance of fresh period. (2) 5% lecithin powder is added in the bread to enhance the flexibility of steamed buns and cakes, the powder reduces the stickiness and soften the products, enlarges the volume, makes the surface smooth, inner ferment inner part is closely knitted. The flavor of the bread is fully supplied and not easily lost. 2. Margarine: Lecithin supplement helps emulsification. Generally, 0.5%-1.5% of the lecithin powder makes margarine less spilling when frying. Content in unique package contains more water and salt. Lecithin also prevents margarine from getting rancidity and prolonged preserving period. The powder of margarine has been revised to avoid water repellent and made surface moisture. 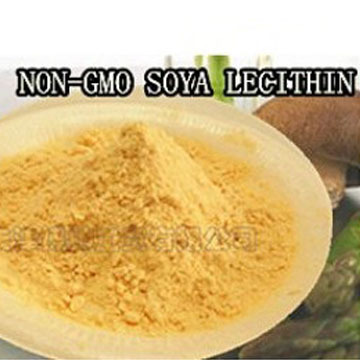 Lecithin greatly improves the moisture and dispersing nature of the selling products. Lecithin is used to stabilize the protein in the margarine. 3. Macaroni, egg made noodles, and dried noodles: 10% of the powder lecithin is added into the boiled macaroni and noodles. Lecithin makes fewer broken in the noodles, and creates more flexible taste, and soften the noodles, it also helps to create crispy taste and controls crystallizing. 4. Ice-cream: Lecithin is added into the ice-cream to prevent water leakage, enhance the crisp, and controlling crystallizing. 5. Cheese: Lecithin is added into the cheese to reduce the tensions and create space between the products. 6. Sweets, chocolate: 1.5%-2.5% of lecithin powder is added for emulsification which quickly combines the sugar and butter. Lecithin helps prevent crease, particles and oil leakage. 7. Application on other aspects: Lecithin is added into the sauce and seasoning, juice, sausage, and drinks so that the flavor tastes better. Package: the inner package is the double low pressure polytene plastic bags and aluminium foil. The specification is 1kg, 5kg,10kg, 20kg per package, the outer package is made by manila. Net weight for every package is 20kg, or we can make package designed by our customer.